Home Skin care Remove acne and pimples from your face? (1) Take two tablespoon of honey and one tablespoon of cinnamon.Mix them together properly and makes the paste.Then apply the paste on your mask to your face and leave it for 20 minutes then wash it completely with clean water.Repeat this process twice or thrice a week until you get the desired result. (2) Take one tablespoon of milk and one tablespoon of honey then mix them properly.After that apply the mixture with a cotton pad gently and leave it for 25-30 minutes let it sit in your face completely.Then wash your face with clean water and repeat this process twice a week for better result. (3) Take two or three strawberries and rinse them then mash them gently,be careful that they don't get over mashed.After that, mix the mashed strawberries with 1 tablespoon of honey.Then apply the mixture on your face gently and let the mixture sit for 15-20 minutes. Then wash your face completely with warm water. (4) Take banana peel and rub it in a circular form all over your face properly.Then leave it for 20 to 30 minutes let it sit completely and then wash your face or rinse it carefully with fresh water.Repeat this procedure or process once a day regularly until you get the positive or desired result. (5) One of the best and easy solution of the acne and pimple problem is aloe vera gel.Apply the aloe vera gel directly your problem area and leave it for 15 minutes let it dry completely.Then wash your face with fresh and clean water,Repeat this process twice a day regularly until get the desired result. 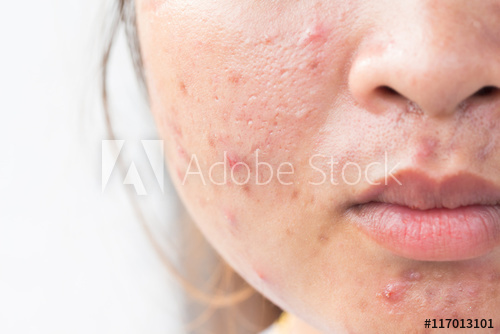 (6) Take a raw potato and grate it then rub the pulp and juice onto your face or problem area for few minutes in a circular motion.Then leave it for 20-30 minutes let it dry completely.After that wash your face completely with warm water.Repeat this process once a day regularly until you see the gradual change or get desired result.